"Nice and clean, comfy bed"
Have a question for Kiwi Express Hotel – Jiuru? "Pros: bus stop in front of hotel unlimited coffee/tea/hot choco and biscuits in lobby all day Cons: Few choices in breakfast"
"The buffet breakfast offered are in high quality." 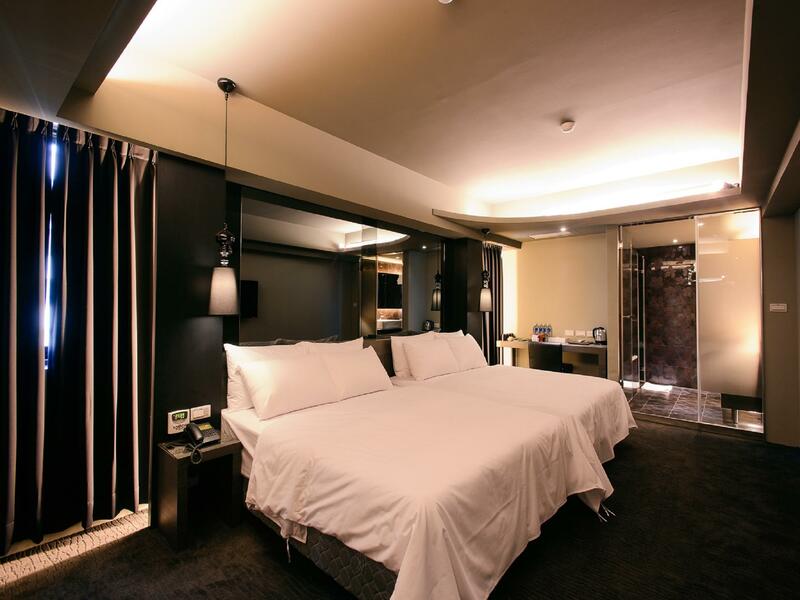 "I like this hotel, simple boutique hotel with all the things..."
Renovated in 2014, the Kiwi Express Hotel – Jiuru guarantees guests a pleasant stay whether in Kaohsiung for business or pleasure. With its location just 1 km from the city center and 10km from the airport, this 3-star hotel attracts numerous travelers each year. With its convenient location, the hotel offers easy access to the city's must-see destinations. At Kiwi Express Hotel – Jiuru, the excellent service and superior facilities make for an unforgettable stay. For the comfort and convenience of guests, the hotel offers free Wi-Fi in all rooms, laundromat, taxi service, wheelchair accessible, 24-hour front desk. In addition, all guestrooms feature a variety of comforts. Many rooms even provide television LCD/plasma screen, linens, mirror, internet access – wireless, internet access – wireless (complimentary) to please the most discerning guest. Besides, the hotel's host of recreational offerings ensures you have plenty to do during your stay. When you are looking for comfortable and convenient accommodations in Kaohsiung, make Kiwi Express Hotel – Jiuru your home away from home. "Ideal for travellers with car as they offer free parking." Triple room with high C/P value. The room is tidy and clean but relatively small for triple room, insufficient space to place luggage. The buffet breakfast offered are in high quality. Free car park could be requested which is on the opposite side of the road of the hotel. A bit far away from railway station from the hotel, but convenient to get all you need nearby the hotel. The stay in Kiwi was perfect for me. Stayed at the ground floor and the hotel has just renovated. Gym room was not ready then but is ok for me. The breakfast was not good but there's a lot of breakfast shop around the corner so no worries. The stay was great !! However, the laundry ruin our day, the dryer was not working we paid 50ntd , and the clothes was still wet like I just got it out from the washer, I talk to the receptionist however she denied that the dryer was not working . Wasted my money. It's located quite at the centre of KaoHsiung. Pretty convenient to travel around those famous sight-seeing places. Their services are quite good, cleans the room everyday. Breakfast is great, there are a lot of extra facilities like gaming room, washing machine, etc. Consider the price they are charging, it's really the best bang for the buck hotel for travellers that wants a classy or cozy room on a low budget. Highly Recommended! 2nd visit to Kiwi. 1st time was in August, double room was clean and comfortable. Stayed at their triple room during this trip for 7 nights and was very disappointed. Room smelled and wasn't very clean, also the shower was only separated by a shower curtain (which we weren't very comfortable with). Requested if we could switch room (or pay for an upgrade to the quadruple room) but was told because we booked through agoda we had to cancel our booking and request for a new room at the reception (which means paying even more and being subjected to agoda' s cancellation policy). Also, staffs seem to be very under-trained. When we asked for directions to couple of destinations (on different occasions) they seem to provide a standard answer 'we're not sure. You have to take the taxi' (I later found out on my own the public transport route which was easy). As an avid traveller, this is one of the rare occasions tht I've met with receptionist tht are so unfamiliar with their local area. We arrived around 1am after a late flight, no issues checking in. Our booking included breakfast which was buffet! Heaps of options for breakfast, really enjoyed that. Hotel also has great facilities, with a play room with kids toys as well as a small gym. We were there during Typhoon Dujuan and our room window leaked making the floor quite wet, but we had no issues changing rooms quickly in the morning. Staff were super helpful, and there was always someone there who spoke good English which really helped. Location is not the most convenient, but there's a bus stop right outside the hotel with two buses (60 and i28) that go straight to Kaohsiung main station and you can get anywhere from there. There's also a really nice and cheap dumpling noodle place just around the corner on the hotel block, but no English there. But all 4 dishes we tried there during our stay were great! All up very pleased with our stay, and would happily go back. It was a great stay! love the hotel room! very comfortable. It was only a few hours stay at this hotel as I was rushing to meet my friends the very next day. However I don't feel warm greeting from the staff nor do I feel the receptionist care about the guest there. The room is cozy and quiet, and I sleep well that night.